What I present to you today is a versatile recipe that can be adjusted in so many ways. You can make it as a quick weeknight meal, when you are short on time and still want to bring something delicious and nutritious to the table. You can turn it into a romantic dinner and pair with some red wine. It can be comfort food for the family to enjoy on a Sunday lunch. 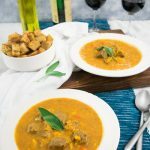 No matter the type of meal you are looking for, you are sure to find in this basic stew recipe, a way to make it happen! 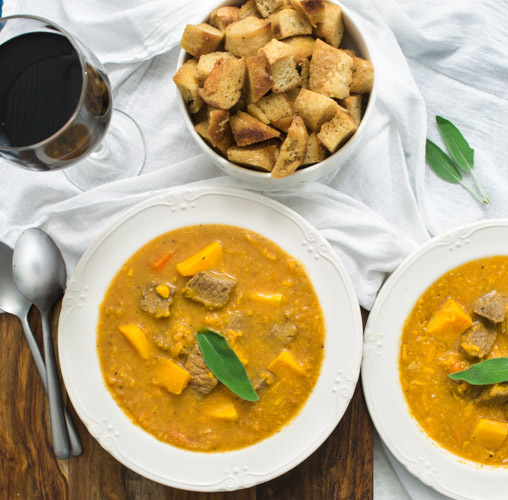 This simple stew recipe calls for beef broth, tomato juice, garlic, sweet potatoes, carrots, beef, and spices. 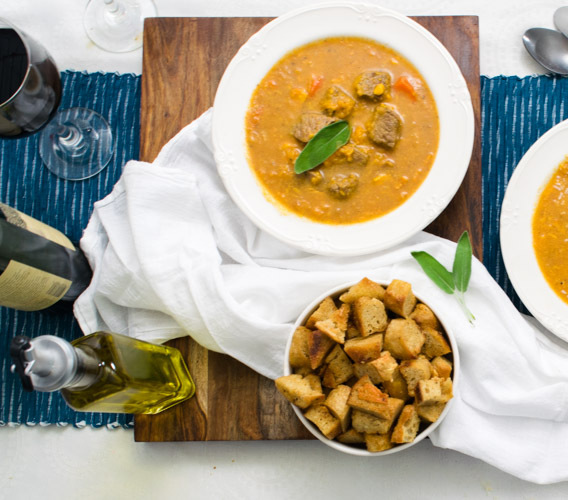 There are actually two ways you can make this stew in the instant pot; the easy way that’s ready in about 40 minutes, or the slightly longer (but even yummier!) version. The easy version: throw everything in the instant pot, cook for 30 minutes and then serve. That’s the quick way out. It provides your family with a great meal that wasn’t a hassle to put together. 30 minutes cooking plus 10 minutes prep time, I’d say that’s as practical as stew gets! -Sprinkle salt and pepper over the meat and sear in some hot olive oil over medium high heat in a frying pan until just browned. Remove the meat and deglaze the bottom of the pan with ¼ cup of broth. Add the carrots and garlic to the pan and sautee them for a couple of minutes. Then transfer the carrots, garlic and all the juices from the pan to the instant pot with the rest of the ingredients and proceed cooking. If you are using a pressure cooker, you can sear the meat in the pressure cooker itself, just remember to do in batches otherwise the meat will release a lot of liquid and won’t be able to sear. -If the sweet potatoes cook for the whole 35 minutes in the instant pot, they will end up very mushy, almost dissolved. If you want the potatoes to be firm and whole, I recommend stopping cooking at the 25-minute mark, adding the potatoes and then go back to cooking for an additional 5 or 10 minutes. -Add a handful of pearled barley or farro, which are hearty grains to the instant pot together with the sweet potatoes at the 25-minute mark and you will experience a definite improvement to your dish. I also like to use my homemade stock, because I get to make a very rich and flavorful stock which adds to the flavor of the final dish! 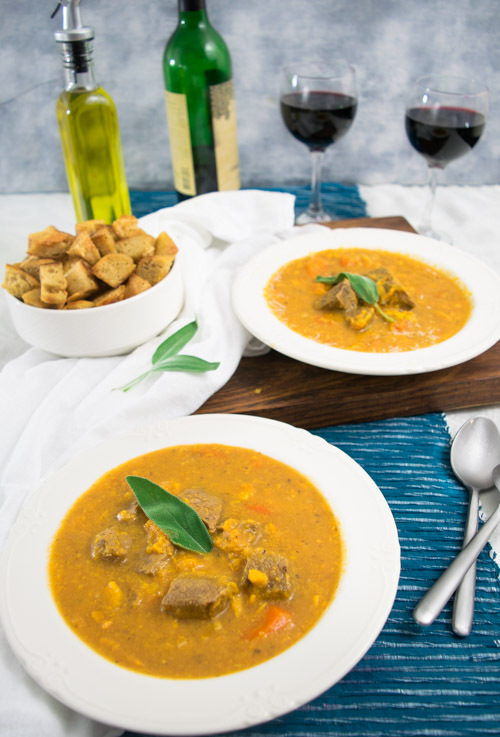 Whatever you do, homemade stock or store-bought, sear the meat and sautee vegetables first or just throw all the ingredients into the instant pot, this recipe will provide you with comfort food and many options of tweaking and twitching ingredients and method to your liking. Serve it with rice, pasta, bread or croutons. Or just by itself! Knowing about how many options you have in the kitchen when making a recipe like this will give you autonomy and versatility to transform simple dishes into stunning meals! In an Instant Pot, place everything ingredient in and stir coating everything evenly. Select the stew/meat setting (about 35 minutes). Once completed, allow stew to sit for 10 minutes before releasing the steam. Sprinkle salt and pepper over the meat and sear in some hot olive oil over medium high heat in a frying pan until just browned. Remove the meat and deglaze the bottom of the pan with ¼ cup of broth. Add the carrots and garlic to the pan and sautee them for a couple of minutes. Then transfer the carrots, garlic and all the juices from the pan to the instant pot with the rest of the ingredients and proceed cooking. If you are using a pressure cooker, you can sear the meat in the pressure cooker itself, just remember to do in batches otherwise the meat will release a lot of liquid and won’t be able to sear. If the sweet potatoes cook for the whole 35 minutes in the instant pot, they will end up very mushy, almost dissolved. If you want the potatoes to be firm and whole, I recommend stopping cooking at the 25-minute mark, adding the potatoes and then go back to cooking for an additional 5 or 10 minutes.